The railway line was constructed in 1861, and the year before a township was surveyed on the future site of Macedon. A hotel was built in the year of the survey. The area was first named Middle Gully, a once-permanent creek. Prior to the hotel and the railway there had been a gold find at Middle Gully (1851), bringing a few settlers and traders who provisioned travellers about to embark on the northwards journey through the Black Forest. A school was opened at Middle Gully by the Combined Protestant churches in 1859. Timber milling found a ready market in an expanding Melbourne. Within a few years of the opening of the railway, Middle Gully's name was changed to Macedon. 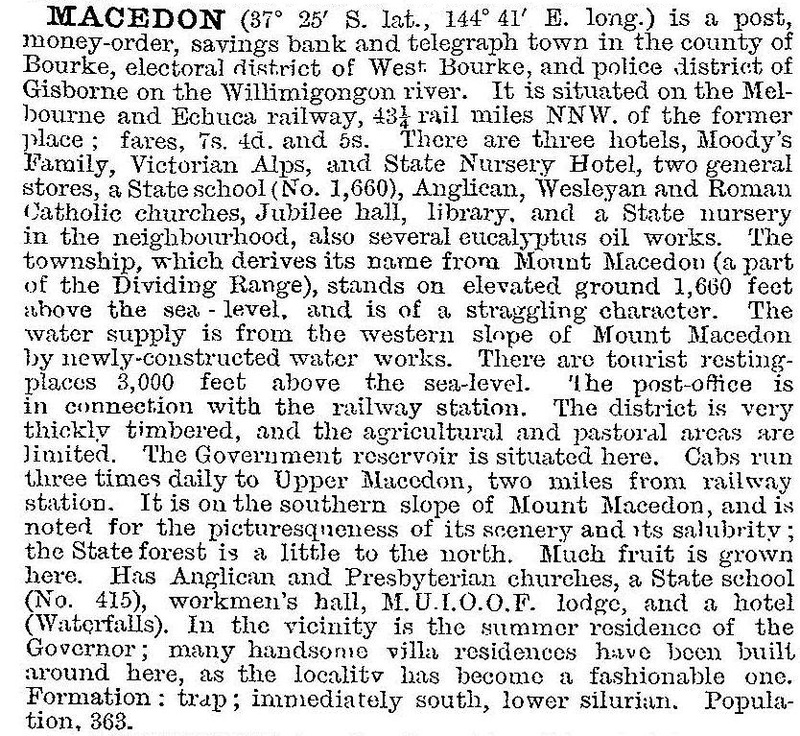 The Macedon township coexisted with Upper or Mount Macedon. Where timber had been felled at Mount Macedon its place was taken by orchards, plant nurseries and increasing numbers of large houses. The railway at Macedon transported horticultural produce to Melbourne and was the stopping-off point for visitors to resort facilities on the Mount. The town was a source of labour to upkeep the houses and grounds. After World War II several large houses were converted into guest houses. In 1970 the Tullamarine Freeway was opened, putting Macedon within easier commuting distance of outer metropolitan Melbourne. The population doubled during the next 25 years to about 1250 people. Macedon township was devastated by the Ash Wednesday bushfire on 16 February 1983. In Macedon and Mount Macedon 499 houses and eight lives were lost. Most of the shops and the Catholic and Anglican churches (1891, 1931) were burnt, along with the Jubilee hall, the fire station, the school and the Water Board's office. Many residents sheltered in the Australian Counter Disaster College. Shops, churches, the hall and the school were rebuilt. In 1998 the school had nearly 200 pupils and the enrolment in 2014 was 235. In 1995 the Government closed the State nursery. Macedon Grammar school was closed in 2014 and the site purchased the following year by children's author John Mardsen with plans to open a secondary school for 200 pupils focused on the arts in 2016, based on the same principles as his Candlebark School (2006) in the Macedon Ranges.